In this week's book club, we take a quick look at The Savage Tales of Solomon Kane by Robert E. Howard in a fantastic paperback edition by Del Rey and published by Penguin Random House. Before the success of Conan, there was Solomon Kane. 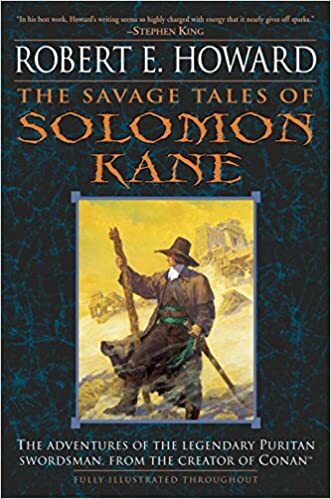 Written by no other than Robert E. Howard, the 16th / late 17th century Puritan Solomon Kane wandered Europe and the deep in the jungles of Africa with the sole purpose of vanquishing evil. Solomon’s adventures were chronicled mainly in a series of stories and poems first published by Weird tales (a pulp-era science fiction magazine). As a side note, the term pulp comes from the from the cheap wood paper on which the magazines were printed (those printed on higher-quality paper were often called “the slicks”). With nine short stories published, poems and unfinished fragments completed by other authors, comics and film versions, Solomon Kane will go down in history as one of the most iconic characters of science fiction. Perhaps not as profitable as Conan, true, but extremely popular nonetheless. The moon began to rise, lean and haggard, like a skull among the stars. It is worth to mention that the order of publication in Weird Tales does not coincide with the order in which the Solomon Kane stories were written. The best way to enjoy Solomon Kane is, then, by acquiring one of the many of the many editions that compile the slayer’s adventures. One of these books is “The Savage Tales of Solomon Kane”, by Del Rey (2004) and sold by Penguin Random House. This edition comes with illustrations by Gary Gianni and an introduction by H.P Lovecraft, who was friend’s and pen pal’s with Lovecraft until the day he tragically committed suicide. This version printed by Del Rey its top quality. The wonderful black and white illustrations at the beginning of each story makes of this edition a real treasure for those looking for an introduction to Solomon Kane. With so many pulp-era authors getting beautifully edited reprints, comics and movie treatments, something tells us Solomon Kane is not doing with his travels.